As the debate over whether the statue of former Philadelphia Mayor Frank Rizzo in Center City should go down, a mural of the controversial city official has once again been vandalized. Multiple media reports say the mural off East Passyunk Avenue in South Philly was hit early Saturday morning. According to NBC10, a police officer heard glass break around 3 a.m., and responded to find three masked men with jars of paint, spray-painting Rizzo's image. Photos of the vandalism show a white mark in the center of his face. Written at the bottom of the mural was "Kill killer cops" and "RIP Dave," likely a reference to David Jones, who was shot and killed by police in June. This is at least the third time since May that the mural has been vandalized, NBC noted. It also comes less than 48 hours after Rizzo's statue in front of the Municipal Services Building was spray-painted with the phrase "black power," an incident that followed a protest demanding the removal of the statue. Activists say the statue celebrates a former mayor and police commissioner who targeted black and gay communities. Black Lives Matter activist Asa Khalif, who is at the forefront of the call to topple the statue, told PhillyVoice earlier this week the cause is motivated by accounts of older black residents who lived through Rizzo's administration. 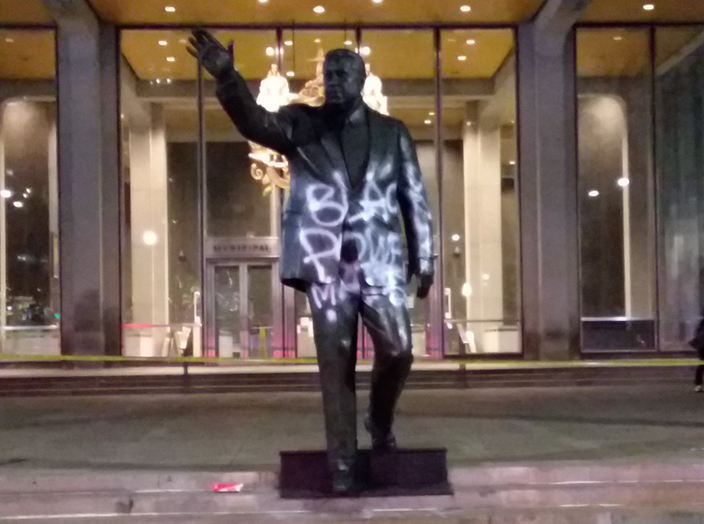 A statue of former Philadelphia Mayor Frank Rizzo was found spray-painted with the phrase “black power” on Thursday night. "Everyone out there has relatives who are older … elders who say, ‘Hey, this happened,'" he said. “We should not have to be reminded with a ‘f*** you’ every time we see that damn statue." Joining the call to remove the statue has been City Councilwoman Helen Gym, who made parallels to the many Confederate monuments around the country being taken down. Rumblings about the statue and whether it should stand have come in waves for years, but the recent campaign for removal has intensified after the violence in Charlottesville, Virginia, during a demonstration of White Supremacists and Nazis. Those in favor of keeping the statue argue Rizzo was responsible for promoting black officers and breaking down racial barrierswhile serving as police commissioner. "It was during Rizzo's tenure as deputy commissioner that black and white officers assigned to the city's African American neighborhoods worked in tandem in an attempt to reduce friction between civilians and police forces," states a petition to the city to preserve the monument. Mayor Jim Kenney has not advocated for either keeping or removing the statue, but has encouraged a civil discourse on the issue. His spokesperson Lauren Hitt told PhillyVoice that "now is a good time to have that conversation about the statue's future."